The great bourgeois parties of the preceding period (PD, FI) crumble; What’s left of the Workers Movement (PRC, Leu) does not benefit from it; Two previously marginal parties (M5S, LN) are the ones who take advantage of it. For supporters of the Dégagisme, the general elections in March in Italy confirm that There is a wave Dégagista In Europe» (Bastien Lachaud, deputy France, Unsubmissive, Lci, 5 March). A term that puts in the same sack the beginning of the social revolution of Tunisia in 2011 with the electoral victory of the capitalist Trump in the United States in 2016, or the current one of the reactionary parties in Italy, is not that it is very illustrative. On the other hand, to date today, the LFI It has not presented a real analysis of the Italian elections, not more than the PCF or the PS. The Macron-Philippe-Collomb Government is Take advantage of it to Justify his hunting to the immigrants to the Trump mode and his bill inspired by Sarkozy and Le Pen. The French state has contributed to the “Strong migratory Pressure” In Italy, suspending the agreements of Schengen, closing since 2015 its Italian border to the emigrants, like the Swiss state (not a member of the EU, but yes of the space Shengen). Most of the emigrants who boarded the Italian coast were not meant to stay but were found locked up there. This policy by Hollande and Macron has contributed greatly to the success of xenophobic and anti-EU slogans in the neighboring country: “There is a widespread feeling that its EU partners have left Italy alone with immigration.” (The Economist, March 10th). Italian capitalism got a large-scale accumulation after the 2a World War, leaning on the betrayals of PSI and PCI, in the reconstruction of the devastated economy and in the CEE-European Union. With economic growth and emigration, the unemployment rate fell to 3.6% in 1963. But Italy Saw Particularly affected by the global capitalist crises of 1973-1975 and 2007-2009 (GDP fell by-5.5% in 2009 compared to 2008). It suffered four years of recession (2008-2009 then 2012-2013), which involved a GDP regression of about 9% compared to its situation in 2007 and a doubling of the unemployment rate (from 6% in 2007 to 13% by the end of 2014). In fifteen years, 200,000 university graduates left the south to emigrate to the north or abroad. Like all other capitalist states, including China, the Italian state resorted to the budget deficit in the face of the crisis (budget balance of-5.2% of GDP in 2009) without worrying about the European Union rules in force since 1992. (The 3% of GDP at most). Public finances were marked by high debt (The 132% of GDP, when the rule is less than 60% maximum), limiting the margins of the budgetary policy of the Italian bourgeois state. Governments Letta (2013-2014), Renzi (2014-2016) and Gentiloni (2016-2018) strove to reduce the deficit (-1.9% of GDP in 2017) and thus debt. These governments led by the PD proceeded, like all bourgeois governments, by cutting public expenditures that serve firstly the workers and accusing the EU in good conscience of being the culprit of the Austerity: « Politicians rejected responsibility for reduced growth because of EU-imposed austerity». (The Economist, March 10th). LFI attributes the austerity, Italian or French, abroad, to “Europe”, even if it applies even more severely in Britain, which has kept its currency and decided to leave the European Union. As recognized by a former President of the Council (Prime Minister) of 2011 to 2013: “Even without European mandates, we should have a certain discipline.”(Mario Monti, Le Monde, March 2). It is remarkable that the EU, exerting pressure, never sanctioned Italy for its faults with both rules. Between the capitalist crisis and state austerity, hundreds of thousands of people sank into misery, especially in the south. On the other hand, the army, the police and the banks receive more than ever the public manna, without talking about the criminality mafia that Continuous Parasitizing Italy. In order to try out the Marasmus, all the Italian bourgeois governments have helped the capital and hit the workers: cut in the social expenditures (education, health, etc. ), reduction of the taxes on the capital, enlargement of the retirement age (65 Years for men, 60 years for women), reduction of pensions (calculation on wages of the whole of the working life), more flexible employment contracts, increase of the tuition fees in the university, the salary «to merit» for the professors, etc. Thanks to the increase in the rate of exploitation and the European and global situation, Italian capitalism eventually resumed growth from the end of 2014: + 1% in 2015, + 0.9% in 2016, + 1.6% in 2017 (but the average is + 2.2% in the eurozone and + 3.7% in mu Ndo, for the same period). Recovery translates into crisp job creation ( +900,000 in the period 2015-2017), the employment rate of the working-age population refounded its pre-2008 level (58.4%) and the unemployment rate was down. But it continues High: 10.8% of the workforce and up to 32.2% in young actives of 15-24 years. Unemployment stays at 18% in the south. In these conditions, Italian capitalism, though not deprived of overexploiting foreign workers, does not need a massive immigration, contrary to German capitalism. Italian parties that make foreigners the main target of their attacks (LN, FI) total more From El Third of the votes expressed. If they are added to those who, without making the axis of their policy, also want to reject the emigrants (M5S, PD), exceeds 84%. Apart from the PRC, the only remaining mass workers ‘ organizations are traditional trade unions. The main confederations are the Foreseeable: CGIL (more or less equivalent of the CGT [or CCOO in Spain, NDT]), CISL (equivalent of CFDT [origin in the Christian democracy, like ELA-Stv In Euskalherria, Ndt]) and Uil (equivalent of FO [or UGT in Spain, NDT]). But, as in all imperialist countries, trade union apparatuses are corrupted by the bourgeois state and the capitalists. Occasionally, they are forced to call “action days” that serve as escape valves for the bases, while negotiating interrupted attacks on the working class, exacerbated by recurrent capitalist crises and international competition. In July 1992, the bureaucracies of CGIL, CISL and UIL gave up the mobile scale of wages due to Confidustria (The Medef Italian [Confederation Employers, NDT]). In July 1993, they signed a collective bargaining agreement to two Levels: of branch and Enterprise. Trade unions were committed to taking into account both macroeconomic constraints and companies ‘ competitiveness. In November 2012, the bureaucracies of CISL and UIL signed with the employer a “productivity” agreement that links salaries with the results of companies. Enterprise agreements now supersede collective agreements in what affects the organization of work. In June 2013, the bureaucracies of the confederations of CGIL, of CISL and of UIL signed with the employer an agreement on representativeness. The signatories are guaranteed the monopoly of the representation of the personnel in the companies. As a result, the other unions (Cobas, CUB, USB, CSB) are almost impossible to participate in the elections of staff delegates in the companies. In January 2014, the bureaucracies of the confederations of CGIL, of CISL and of UIL signed with the employer an agreement that allowed derogations of the national collective agreements on the conditions of work the timetables and the wages. On February 28, the eve of the elections, the bureaucracies of the confederations of CGIL, of CISL and of Uil Signed with Confindustria A wage agreement that privileges the level of the company and conditions wage increases to productivity gains. Thus, the social-imperialist apparatus of the unions contribute to the political and ideological disorientation of the working class, completing the historical betrayals of the ex-PSI and the ex-PCI, as well as the “reformist” orientation of the small parties that have survived the shipwreck of Social Democracy and Stalinism (Leu, PRC). Both the old “center-left” the olive-PD, when it was at the head of the government (2006-2008, 2013-2018), as the old “center-right” PDL-FI, when it was his turn (2001-2005, 2008-2011), tried to limit the immigration. On the one hand, the state locked up workers and young people who had committed no crime or crime (in the ICN, the face, or the CDA) ; On the other hand, attempts were made to prevent the entry (agreements with the Libyan warlords, patrols at sea), all with the help of the EU. Thus, in October 2013, after the death in a single shipwreck of 366 emigrants in Lampedusa, the government Letta (PD coalition with, among others, the Berlusconi LDP) activated operation Mare Nostrum, replaced in November 2014 by the less expensive and EU-charged Triton operation. In July 2017, the PD government, like that of LREM with France at the same time, blames to the organizations that help the emigrants. Blocked in Libya, African emigrants are often Extornsionados, reduced to slavery, victims of abuse, raped, murdered. The PD uses the Minister of the Interior and the mayor of Macerata, as well as his influence on the CGIL (the main trade union centre) and on the Associazione Nazionale Partigiani of Italy (the association of former members of the Resistance), to prevent demonstrations of protest. In spite of the official prohibition, the fascists of Forza Nuova They concentrated in Macerata on February 8, with the complacency of the police and the Carabineros (gendarmerie). The Centri Sociali (CS, an anarchist movement one of whose fractions supports the electoral coalition Pap) convened a demonstration on 10 February in Macerata. Party coalitions adhere Liberi and Uguali and Potere To Popolo, Fiom (CGIL Metallurgy Federation), Cobas (South kinds), etc. : There were at least 20, 000 protesters. On 25 February, another 20,000 people, especially young, were They expressed In Milan. In Livorno, when the CS were against-manifested against the IDF provocateurs, the leader of Pap Maurizio Acerbo supported the anti-fascists but the spokesperson for Leu Pietro Grasso condemned them. 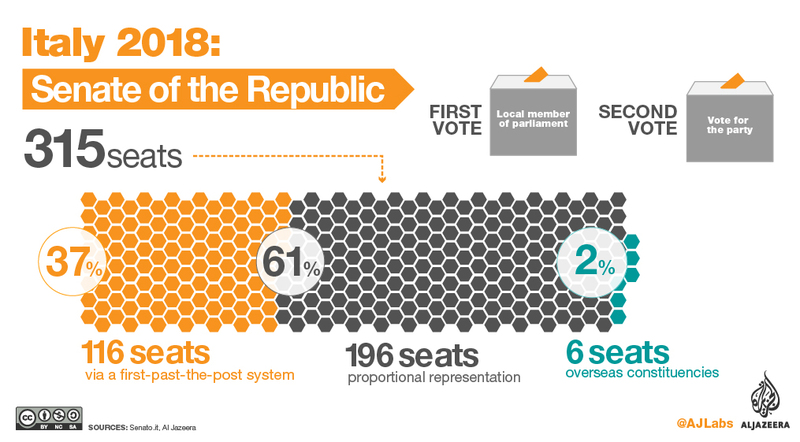 On 4 March, the participation in the elections of both chambers (House of Deputies, Senate) has been high: 73% of those registered, although slightly lower than the general previous elections, in February 2013 (75%). The Partito Democratic (PD, Democratic Party) is the bourgeois party that has been the axis of the preceding governments. It comes from the merger in 1998 of the Renegades of Stalinism (PDS, the majority of the former Italian Communist Party) and of survivors of clericalism linked to the Catholic Church (PPI, main component resulting from the missing party Christian Democrat who led the country for 40 years. The PD votes went from 25.4% in 2013 to 18.7% in 2018. Its general secretary, Mateo Renzi, has been forced to resign. The other bourgeois government party, Forza Italy (FI, Fuerza Italia), founded in 1994, is also crumbling (it has gone from 21.6% to 14%). It’s not safe for him to survive his 81-year-old boss. The great winner of the March 4 elections is the Movimento 5 Stelle (M5s, 5-Star Movement), a small bourgeois demagogic and xenophobic party created on a basis of Dégagisme [See note Pg 1, NDT] In 2009 by a clown who passed the baton to Luigi Di Maio. 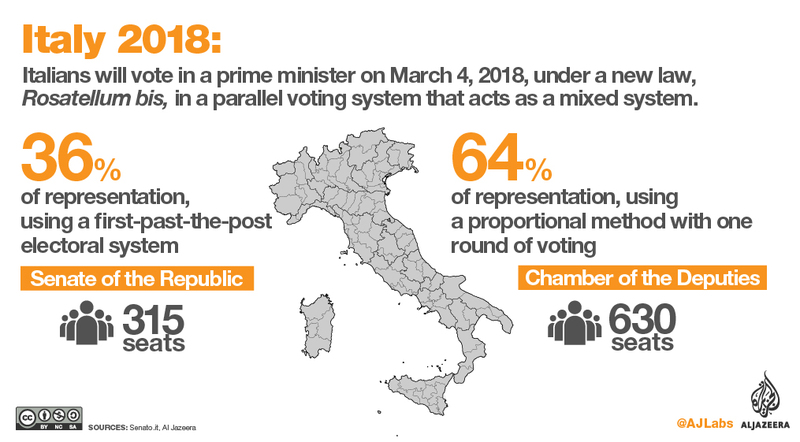 Denouncing the abandonment of the south and thanks to the promise of a “citizen’s income”, the M5S has captured more than 32.7% of the votes across the country (compared to 25.5% in 2013) and is clearly a majority in the South. has been congratulated by Farage, the former leader of UKIP, the party that promoted the Brexit. The other party that comes out well, with 17.4% (compared to 4.1% in 2013), is the Lega de Matteo Salvini (former Lega Nord, Northern League). it never exceeded 10.2% of the vote before. Maintains its previous racism but it has changed its old program (the secession of the richest part of Italy) by an aggressive Italian nationalism. The leader of the League has been successful in Bet: Complete the mutation of the Federalist Party and Anti Italian, from which it took the lead less than five years ago, in a great nationalist and xenophobic formation, spreading throughout the country. (Le Monde, On March 7th). LN wins within the coalition called “Center-Right” (sic) which included, in addition to FI, another fascistic party, Fratelli d ‘ Italia (IDF, brothers from Italy), who got 4.35% of the votes. He has received the congratulations of the Chief of the French FN-RN. 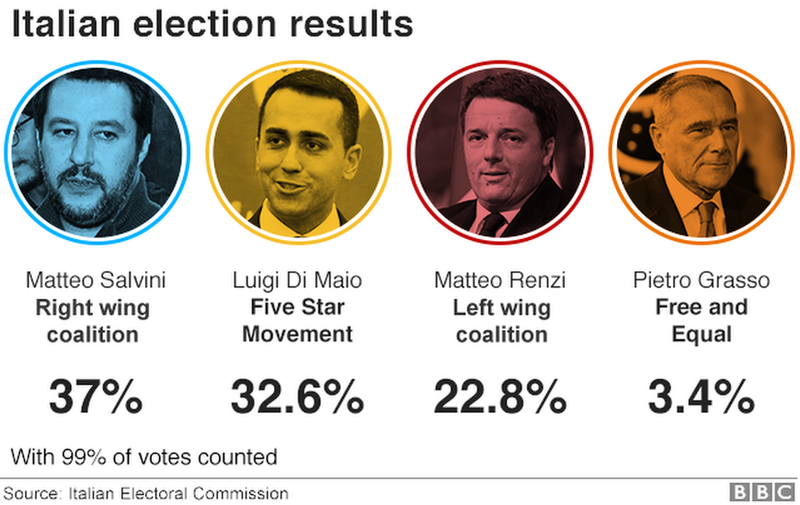 In addition, two fascist lists, CasaPound and the Italy Coalition Agli Italiani (Italy for Italians, formed by FN and MS-FT) have respectively 0.95% and 0.38% of the votes. These groups physically attack militant workers and foreigners. The two major reformist parties of post-war, Partito Socialista Italiano (PSI) and Partito Communist Italiano (PCI) disappeared, respectively in 1994 and in 1991-2007. Those who occupy today the place of the social democracy in Italy, the left-wing divisions of the PD and the right of PRC, gathered in the coalition of Sastre Liberi and Uguali (Leu, free and equal), have the limit of votes at 3.4%. The main reformist party that survived the disappearance of PCI is Partito della Rifondazione Communista (PRC). In 2013, their mini Popular Front with the Movimento Arancione and the Federazione Dei Green gathered 4.4% of the votes. In 2018, it is once again a coalition, Potere To Popolo (Pap, power to the people). It includes the Italian Communist Party (a PRC scission that raises the Italian bourgeois flag next to the red flag), the Piattaforma Eurostop (A Europhobic front), the Cracks (Estalino-Maoists), the Sinistra Capitalist (Sac, left Anticapitalist linked to the NPA… This electoral block is held in France by NPA, PCF and LFI. It has obtained only 1.32% of the votes expressed and no member. The neo-Stalinist excision of RPC, the Communist Party (PC), which has been presented separately, is marginal, with 0.32%. The PRC, the PCI, the PC, the cracks… never learned the lessons of Stalinism. The history of Stalinism-Togliattismo It is that of the hand outstretched to fascism by the PCI in 1936 (“Call to the Fascists”), the treachery with the revolution of 1943-1944, the participation in the bourgeois governments of 1943 with 1947, the attempt to restore the monarchy in 1944 (“Giro of Salerno”), the treason with the IF Revolutionary sight in 1969, the proposal to govern jointly with the DC in 1973 (“Historical Commitment”), the open resignation of Marxism with the transformation in 1991 of the PCI in PSD, the clearance of the PSD in 2007 in a normal bourgeois party (PD) with what remained of Christian democracy discredited and prosecuted by the justice system. This has not prevented the majority of the centrist currents of the world from giving enthusiastic support to the PRC throughout the end of the twentieth century, including “Trotskyists” streams coupled with protectionism, pacifism, and reformism. This resulted in the incorporation of their local affiliates into the PRC (and their integration into old or new trade union bureaucracies) just as they have already done by participating at the same time in Syriza, in Greece, in Die Linke, Germany, etc. The PRC practiced international class collaboration by assembling the World Social Forum Deception in 2001, with the help of Castro’s Cuban bureaucracy, the bourgeois government of Brazil and a wing of the Catholic Church. At the national level, the PRC supported a bourgeois government in 1996 and then participated in a government led by a former Christian Democrat in 2006. It is still linked to PCF, which has ruled more than once on behalf of the bourgeoisie and as Syriza still does in Greece. The Communist strategy was summarized in a motion of the Hague Congress of the first international: the hegemony of the working class, the necessity of the party, the takeover of power. In its struggle against the United power of the holding classes, the proletariat can only act as a class by constituting itself in a separate political party and opposed to all the former political parties created by the possessing classes. This Constitution of the proletariat in political party is indispensable to ensure the triumph of the social revolution and its Supreme goal: the abolition of classes. The Coalition of working-class forces, already achieved by economic struggle, must serve as a lever in their struggle against the political power of their exploiters. Since the masters of the land and capital still use their political privileges to defend and perpetuate their economic monopolies and subjugate work, the conquest of political power has become the great duty of the proletariat. (AIT, Article 7a of the Statutes, September 1872, the First International, 10-18, P. 338). Article 7a — In its struggle against the collective power of the propertied classes, the working class cannot act as a class except by constituting itself into a political party, distinct from, and opposed to all old parties formed by the propertied classes. During the electoral campaign, the PRC and its allies did not speak of socialism or of revolution, nor of expropriation or overthrow of the bourgeois state. Things like “Power for the People” or “power” appear everywhere (and nowhere), leaving the exploiters with the most formidable power instrument, the state. “People” makes it possible to replace the class struggle with an aggregate of opposite movements not to capitalism, but to the European Union and the “Mercantilization of the World”. Potere To Popolo It praises the rescue of the capitalism and the reconstruction of the bourgeois State which carried out its predecessors of the PCI from 1943 to 1947. The Coalition Pap He actually wants to improve capitalism and the bourgeois state. The PAP coalition preaches to the exploited and oppressed pacifism that the fascist gangs, E’ejército Imperialist, the secret services, the Carabineros, the police and the Mafia are very careful to respect. Separated from the people, constituting a closed professional caste of men trained to harshly punish the poor, relatively well-paid men and enjoying the privileges of power (not to mention their lawful income), the police are still Inevitably-in all the democratic republics where the bourgeoisie reigns-the instrument, the wall, the safest shield of it. Serious and radical reforms cannot be done in favor of the working masses with their help. It’s objectively impossible. The substitution of a popular militia by the police and the permanent army is the condition for the success of any reform … Lenin, They forgot the essentials, May 18, 1917, Oeuvres, Progrès, T. 24, p. 60). Per A Sinistra Rivoluzionaria (PuSR, by a revolutionary left), the electoral coalition of two organizations that claim to be Trotskyists, has obtained only 0.08%. This is the Communist Party Dei Lavoratori (Pcl, the Communist Party of the workers) and Sinistra Classe Rivoluzione (SCR Revolution-class left) linked to the French GR that supported the candidacy of the social-imperialist Mélenchon in the first round. In general, the currents that left the PRC when it provided a minister to the Prodi government have many difficulties in distinguishing itself from its father: the SAC continues to sow illusions about the PRC. Even the PCL, which has claimed a workers ‘ government during its campaign, is struggling to get rid of popular Frontism: In the municipal elections of Naples, in May 2011, they called to vote for the “progressive” Luigi of Magistris, of the Bourgeois party Italy Dei Value the program Per one Sinistra Rivoluzionaria It says nothing about self-defense, nor about the need to dismantle repressive bodies, as if the army and the police could be “controlled”. Once again, the European Union is in shock, but not because of the working class and even less on the account of the working class. The coup has given the reaction and, even more than in the case of Brexit, is clearly xenophobic. The most fragile sector of the working class serves as a scapegoat for the difficulties of Italian capitalism and the suffering that its survival causes in those who work to live. Indeed, the great Italian and world capital is not glad that such uncertain parties have won the general election, let alone none of them have the capacity to form a government for themselves, in the absence of a parliamentary majority. But the bourgeoisie knows how to bend the parties more demagogic to their needs. When he showed up, Forza Italy was also not a traditional party of the bourgeoisie (it was built around a man, with the support of the television channels). The North League has already participated in Berlusconi’s governments. As for the M5S, he is preparing to become a bourgeois government party. And the M5S has already forsaken one of its fundamental principles: Reject any transaction with the other parties. Whatever the next government is, it will be bourgeois from part to part. Even if fascism is not an immediate danger, the alternative is becoming more and more clear: socialism or barbarism. Either a series of economic, political, ideological setbacks; Either the unity of the exploited to overthrow capitalism, to open the way to the European and Mediterranean revolution. For this, a revolutionary Labor Party is needed. The crisis of the Workers ‘ movement has reached a climax in Italy. It is time that, in relation to the construction of a new international, the most determined and conscious militants, currently dispersed in the PCL, the PRC, the CS, etc., are regrouped on a revolutionary and international basis. will be inspired by Antonio’s efforts Labriola, Amedeo Bordiga, Antonio Gramsci and Pietro Treso. They will be guided by the programs of the League of the Communists directed by Engels and Marx, of the Communist International in the life of Lenin and of the Fourth International in the life of Trotsky. Militants of the Revolutionary Communist Party under construction will know to be at the forefront of the single front in defence of refugees, the right of all workers and students to circulate and settle in Europe, of the daily struggle for Demands and the independence of the unions in the face of the state, the self-organization of the struggles and the centralization of the Soviet organs. Self-defense against the forces of repression and fascist thugs, to open up the prospect of a labor and peasant government, of the Socialist United States of Europe, of the Social Federation of the Mediterranean. Dégagisme: derives from the expression “Dégage!” (Scram!). The”Dégagisme”It is a political neologism popularized since 2011 during the Arab Spring. It is used in French politics to demand the eviction, by force or not, of the person or persons who hold the power, without the will to replace them, which leads to a vacuum of power Wikipedia). Lfi: La France InsoUmise. “Left-wing” party founded in 2016 around the presidential candidacy of Jean-Luc Mélenchon, which was fourth (19.58%), three times more votes than the candidate of the PS (6.36%). Mutual banks: Credit unions. In the Spanish state, for example, the rural boxes. (original note 57) “The International Left Opposition, Its Tasks and Methods.” The Militant, March 6, 8, 1 0, 1 8, and 25, 1933, and Internal Bulletin, Communist League of America, Number 1, 1 March 31, 1 933. Unsigned. A draft of this document was written and edited by Trotsky for the international preconference of the ILO, held in Paris February 4-8, 1 933. The preconference adopted the document after adding several parts – on the Left Opposition in the Balkans; the Left Opposition in Czechoslovakia, reorganization of the International Secretariat, preparation of the international conference that was slated to be held in July 1 933, additions to the “internal” parts on Spain and Germany, and an “internal” part on the American section ­ which are omitted here because they were not written by Trotsky. His first draft was written in December 1 932 for discussion and adoption in 1 933; when it says “this year,” as at the end of the fourth paragraph, it means 1932. Para los partidarios del dégagisme, las elecciones generales de marzo en Italia confirman que «hay una ola dégagista en Europa» (Bastien Lachaud, diputado La Francia insumisa, LCI, 5 de marzo). Un término que pone en el mismo saco el inicio de la revolución social de Túnez en 2011 con la victoria electoral del capitalista Trump en los Estados Unidos en 2016, o la actual de los partidos reaccionarios en Italia, no es que sea muy ilustrativo. Por otra parte, a fecha de hoy, la LFI no ha presentado un verdadero análisis de las elecciones italianas, no más que el PCF o el PS. Aparte del PRC, las únicas organizaciones obreras de masa que subsisten son los sindicatos tradicionales. Las confederaciones principales son las previsibles : CGIL (más o menos equivalente de la CGT [o CCOO en España, NDT]), CISL (equivalente de CFDT [origen en la democracia cristiana, como ELA-STV en Euskalherria, NDT]) y UIL (equivalente de FO [o UGT en España, NDT]). Pero, como en todos los países imperialistas, los aparatos de los sindicatos están corrompidos por el Estado burgués y los capitalistas. De vez en cuando, se ven forzados a llamar a «jornadas de acción» que sirven de válvulas de escape para las bases, mientras negocian ataques interrumpidos contra la clase obrera, exacerbados por las crisis capitalistas recurrentes y la competencia internacional. Así, los aparatos social-imperialistas de los sindicatos contribuyen a la desorientación política e ideológica de la clase obrera, completando las traiciones históricas del ex-PSI y del ex-PCI, así como a la orientación “reformista” de los pequeños partidos que han sobrevivido al naufragio de la socialdemocracia y del estalinismo (LeU, PRC). El 3 de febrero de 2018, un antiguo candidato de la Lega en 2017, después de haber hecho el saludo fascista y gritado «Viva Italia!» disparó contra un grupo de personas negras en Macerata, en el centro de Italia. Seis personas están heridas. El fascista invoca la violación y el homicidio de Pamela Mastropietro por traficantes de droga nigerianis para disparar contra inocentes cuyo único crimen era tener la piel oscura. Berlusconi, cuya formación Forza Italia reclama la expulsión de 600.000 extranjeros y es aliada de la LN en el seno del «centro derecha», infravalora : «me parece que se trata del gesto de un desequilibrado, que merece la condena más firme, pero que no puede considerarsa que tenga una connotación política clara ». La LN gana en el seno de la coalición llamada de “centro derecha” (sic) que incluía, además de a FI, a otro partido fascistoide, Fratelli d’ Italia (FdI, Hermanos de Italia), que consiguió el 4,35 % de los votos. Ha recibido las felicitaciones del jefe del FN-RN francés. En 2013, su mini frente popular con el Movimento Arancione y la Federazione dei verde reunió el 4,4 % de los votos. En 2018, forma de nuevo una coalición, Potere al popolo (PaP, Poder para el pueblo). Incluye al Partito comunista italiano (una escisión de PRC que enarbola la bandera burguesa italiana al lado de la bandera roja), la Piattaforma eurostop (una frente eurófobo), los CRAC (estalino-maoístas), la Sinistra anticapitalista (SAC, Izquierda anticapitalista ligada al NPA)… Este bloque electoral es sostenido en Francia por el NPA, el PCF y LFI. Ha obtenido solamente el 1,32 % de los sufragios expresados y ningún diputado. El PRC, el PCI, el PC, los CRAC … nunca aprendieron las lecciones del estalinismo. La historia del estalinismo-togliattismo es la de la mano tendida al fascismo por el PCI en 1936 (“llamamiento a los fascistas”), la traición a la revolución de 1943-1944, la participación en los gobiernos burgueses de 1943 a 1947, el intento para restaurar la monarquía en 1944 ( “giro de Salerno”), la traición a la situación revolucionaria en 1969, la propuesta para gobernar conjuntamente con la DC en 1973 (“compromiso histórico”), la renuncia abierta del marxismo con la transformación en 1991 del PCI en PSD, la liquidación del PSD en 2007 en un partido burgués normal (PD) con lo que quedaba de la Democracia Cristiana desacreditada y procesada por la justicia. Durante la campaña electoral, el PRC y sus aliados no hablaban de socialismo o de revolución, ni de expropiación o derrocamiento del Estado burgués. Cosas como “poder para el pueblo” o el “poder” aparecen por todas partes (y en ninguna parte), dejando a los explotadores con el instrumento de poder más formidable, el Estado. “Pueblo” hace posible reemplazar la lucha de clases por un agregado de movimientos opuestos no al capitalismo, sino a la Unión Europea y la “mercantilización del mundo”. Separada del pueblo, constituyendo una casta profesional cerrada de hombres entrenados para castigar duramente a los pobres, hombres relativamente bien pagados y disfrutando de los privilegios del poder (por no hablar de sus ingresos lícitos), la policía sigue siendo indefectiblemente – en todas las repúblicas democráticas donde reina la burguesía – el instrumento, la muralla, el escudo más seguro de aquélla. No se pueden hacer reformas serias y radicales a favor de las masas trabajadoras con su ayuda. Es objetivamente imposible. La sustitución de una milicia popular por la policía y el ejército permanente es la condición para el éxito de cualquier reforma … (Lenin, Olvidaron lo esencial, 18 de mayo de 1917, Oeuvres, Progrès, t. 24, p.60). Incluso al PCL, que ha reivindicado un gobierno de los trabajadores durante su campaña, le cuesta deshacerse del frentepopulismo: en las elecciones municipales de Nápoles, en mayo de 2011, llamó a votar por el “progresista” Luigi de Magistris, del partido burgués Italia dei Valor El programa de Per una sinistra rivoluzionaria no dice nada sobre autodefensa, ni sobre la necesidad de desmantelar los cuerpos represivos, como si se pudiera “controlar” al ejército y la policía. Dégagisme: Deriva de la expresión “Dégage!” (¡Lárgate!). El “dégagisme” es un neologismo político popularizado desde 2011 durante la Primavera Árabe. Se utiliza en la política francesa para exigir el desalojo, por la fuerza o no, de la persona o personas que detentan el poder, sin la voluntad de substituirlos, lo que conduce a un vacío de poder (Wikipedia). LFI: La France Insoumise. Partido “de izquierdas” fundado en 2016 alrededor de la candidatura presidencial de Jean-Luc Mélenchon, que quedó en cuarto lugar (19,58%), tres veces más votos que el candidato del PS (6,36%). Bancos mutualistas: Cooperativas de crédito. En el Estado Español, por ejemplo, las Cajas Rurales. Have you a link to the source? No. I’ll look for it.